I’ve just returned from another trip to Downton Abbey. The real Downton Abbey that is, Highclere Castle. At the beginning of this year, as I was waiting for the 3rd season to premier on this side of the world, I decided to spend some time in the real Downton Abbey, courtesy of the current Countess of Carnarvon. Capitalizing on the popularity of the show, she wrote a book about Almina, the Countess of Carnarvon around the same time as the show takes place. Well that book must have been popular because she has followed it up with another one, Lady Catherine and the Real Downton Abbey. I’ve seen it listed on Goodreads as Lady Catherine, the Earl and the Real Downton Abbey and that strikes me as a much more appropriate title for this book. While the first book really mostly was about Almina and her incredible life, Lady Catherine was a much more passive Countess ergo, not as interesting to read about. The current Countess wisely chose to make this book more about the time. Catherine Wendell was born into a wealthy American family in 1900. She lived a privileged lifestyle, descended from some of America’s “best” families until she was 10, when her father lost pretty much everything and decided to try his hand at…acting. He was dead two years later and her mother moved her family to England to be near some cousins. Catherine met Lord Porchester (Porchey), the future 6th Earl of Carnarvon, fell in love and married him. They had two lovely children, and while the responsibilities of running Highclere fell to them rather sooner than they expected (the 5th Earl died in 1923 about six months after Catherine and Porchey married) things were pretty decent. Except that Porchey had a wandering eye. So they got divorced and Porchey was ever after plagued by his love affairs. Catherine married again right before the second world war but tragically her husband was killed in the early days of the war. She spends quite a lot of time in convents, trying to get herself together after periods of intense stress. But while Almina made life happen, Catherine lets life happen, which is much less interesting to read about. Catherine’s children also, unbelievably, do everything they are supposed to. Her son does go to war and she’s (obviously ) terrified but he comes through more or less unscathed. Her daughter is lovely and affectionate and smart and marries appropriately. No scandal or anything. At least Almina was illegitimate and insanely wealthy. The saving grace for this installment of life at Highclere was the window it gave of the time itself. The current Countess was able to get firsthand accounts from some of the people that had worked at Highclere at the time, and were able to give an idea of what it was like to have been young and alive at the time. In the end, I liked Catherine and Porchey and their children but I’m glad that this book ended up being from the library. Although I will say that I liked this cover better than the first. I love reading books about royal-esque women (Queens, Princesses, Empresses, Duchesses, Countesses etc) and I also love reading books about a certain time. You know what combines these 2 things with a healthy dose of Downton Abbey love? 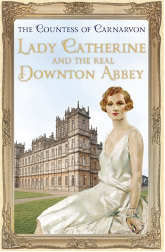 Lady Almina and the Real Downton Abbey: The Lost Legacy of Highclere Castle. You’re up for more Downton reads right? What with the 3rd season getting started in North America. We’re hungry for more. I think that Lady Almina will fit the bill. Obviously the first draw to this book was the connection to Downton Abbey. How many more times do you think I can fit “Downton Abbey” into this post? Highclere Castle is where they actually film the show. But the story of the 5th Countess of Carnarvon (and the Earl for that matter) is a remarkable one. For one thing, Lady Almina was basically illegitimate and she married an Earl. That just did not happen. Her mother was married (to a brutal alcoholic) but Almina was the fruit of a dalliance with one Alfred de Rothschild. If his name sounds familiar, it should. The family were kind of a big deal in banking. Had more money than they could ever know what to do it. Alfred acknowledged his daughter and actually, spoiled her rotten. She married an Earl, actually loved him and was totally accepted into society. I fear I’m giving away too much. Lady Almina lived a glamourous life. She was basically given free rein to do what she wanted. Luckily she felt a huge sense of responsibility to those that depended on her family for a livelihood, and during the Great War, to those young men giving their lives for Britain. She sounds like a really incredible person. The book was full of that’s who that is? moments. Do you know what I mean by that? OK here’s one. The 5th Earl of Carnarvon? The guy who owned the real Downton Abbey at the time? He discovered King Tut’s tomb. So the book is full of that – Lady Almina was very well connected through her father and her husband, even hosting the future King Edward VII for a weekend at the house (her father was best buds with him). On the other side of things, the current Countess of Carnarvon doesn’t shy away from the less glamourous descriptions of life at the time. Life downstairs and on the estate (which had its own farm, dairy and brewery) is fully described as are major battles in the Great War. And the injuries that millions of soldiers suffered. Sometimes it was a bit hard to read because of it. I think we have a tendency to forget what that must have been like – the first time tanks and lethal gas were used in warfare. Another tidbit for you – the current Earl of Carnarvon? Queen Elizabeth is his godmother. What’s your favourite Downton read?